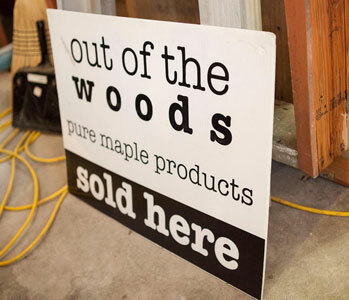 Nestled between Torch Lake, Elk Lake and Grand Traverse Bay, the Woods Farm Produces the finest maple syrup from the sugar maple tree rooted in the old lake shore of what was Lake Michigan 80,000 years ago. Over time, our trees have reclaimed these sandy dunes and now produce the sweetest maple sap in northern Michigan. The sap is collected daily in the early spring and our wood fired evaporator reduces the sweet sap to the natural sweetener known as maple syrup. 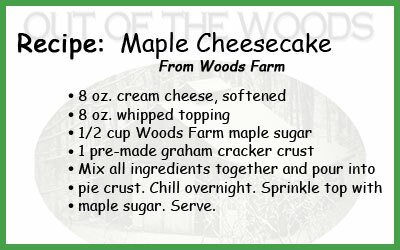 The syrup is bottled for your morning pleasure or made into other products such as maple sugar, maple cream, and maple candy or blended with Michigan grown tart cherry concentrate to make our famous maple/cherry syrup.